The eighth edition of the Marine Firefighting Symposium for Land-Based Firefighters will be held on May 19-21, 2015 in Valdez, Alaska. The three-day conference will educate shore-based firefighters on the best available marine firefighting information and practices, using both classroom and field experiences. Shipboard fires can occur in any coastal community and at any time. The enhanced training offered at the symposium will help firefighters in coastal communities be better prepared to respond safely and effectively to marine fire incidents. Photo of Liberty Bay oil tanker courtesy of Aker Philadelphia Shipyard. The first of two new SeaRiver oil tankers is expected to begin service in Prince William Sound later this year. 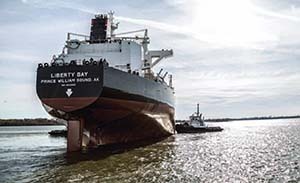 SeaRiver, the shipping arm of ExxonMobil, held a naming ceremony for the vessel Liberty Bay on April 25. The second vessel will be named Eagle Bay. Built by Aker Philadelphia Shipyard, Inc., both vessels measure 823.5 feet long and 144 feet wide, and have double hull protection for both cargo and fuel tanks. The vessels are capable of carrying 115,000 tons of weight including cargo, fuel, ballast water, provisions and crew. Cargo capacity is 800,000 barrels (approximately 33.6 million gallons). Propelled by a slow speed diesel engine, the vessels’ “service speed” is 15 knots (approximately 17 miles per hour). The council participates in various workgroups tasked with updating the Prince William Sound Subarea Plan, and recently submitted comments on proposed changes to the plan. The last update to the subarea plan was completed in 2005. Access to current information is critical in the early hours of spill response. The council recommended that the revised plan contain the most current information on web links; resources such as communications, equipment, facilities and support personnel; sensitive areas; community information; and wildlife impacted.